The Europe of today is the direct outcome of the "Schuman Declaration" of May 9, 1950. It follows the same methods and maintains the same purposes. 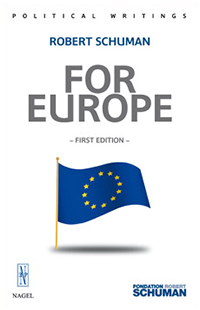 One must read the sole work that the "Father of Europe"devoted to this venture, an unreachable dream that became a tangible reality, in order to understand his approach and the political stakes of this peaceful and determined construction of continental unity, heretofore unprecedented in history. In the very particular context of the era, to which he alludes, Robert Schuman evades none of the questions that one can legitimately pose regarding the European project: the nation, federalism, culture, and the roots of Europe. And under his quill, rather than confronting themselves, the states and the people of Europe combined themselves; a political and determined Europe, rich in its diversity but strong in its unity. This vision remains a necessity for the Europe of today, and a requirement in order to imagine its future.